Here we will explain the Career screen, which displays all the career collated under this same person. All the business card information about this person is displayed as a list here. 1. Access the Details about this person screen. 2. From the Career column, click on either "See details" or "Career" on the left. 1. Here the company name, department, position, and name from the most recently received business card will be displayed for this career. 2. Company name, name, department, position: Here the company name, department, and position will be displayed. 3. Date received: Here the date received and holder's name (department) will be displayed. 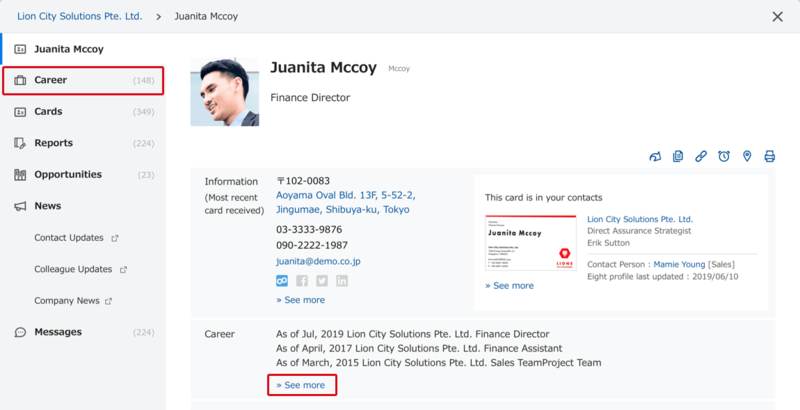 If there is business card information created based on personnel change or contact change news, instead of a date received the following information will be displayed and used for the order of the career. 4. Business card: Here the image of the relevant card will be displayed. If you click on this, it will be enlarged. The back side can also be displayed. * Careers will be displayed in descending order of business card received date, personnel change announcement date, and Eight public profile date updated.